The present Nos. 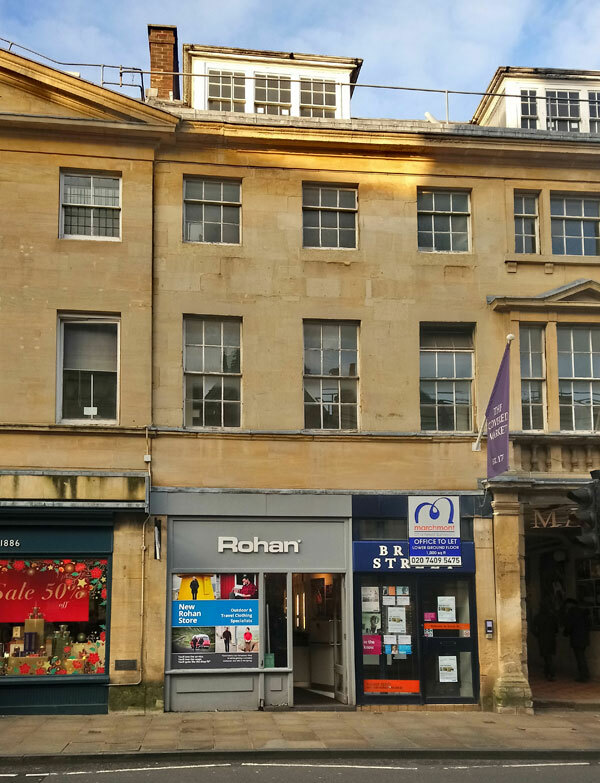 13–16 High Street were built in 1773–4 by John Gwynn to form the frontage to the new covered market and were known as “New Parade”. Nos. 13, 14, and 15 are jointly Grade II listed (List Entry No. 1369376, numbered as 12–15). This shop at No. 16 is separately Grade II listed (List Entry No. 1047270). The four shops forming the original market front were in the parish of All Saints until that church was deconsecrated in 1971. There is an avenue into the market in the centre of this group between Nos. 14 and 15, and one each side: the easternmost entrance is shown above right. The London & County Bank was situated here at 16 High Street from 1842 to 1868. The London & County Joint Stock Banking Company reported in December 1842 that at the close of that half-year three new branches had been successfully opened, one of which was at Oxford, “where the respectable Bank of Davenport Walker & Co. has merged with the London & County Bank”. The bank (later the National Westminster) moved to its present large premises on the corner of Alfred Street in 1868. The upstairs premises were still unoccupied in 1871, and were probably offices. The booksellers Slatter & Rose moved into this shop in 1901 (when they had to move from Nos. 2 and 3 because of the building of Lloyds Bank), and remained until 1956. The extract from an F. Frith & Co postcard on the left shows their shop in 1907. 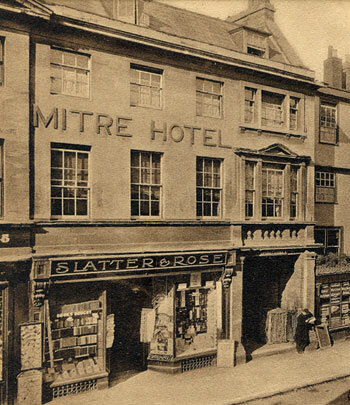 The guest rooms of the Mitre Hotel next door extended over this shop, so there was no listing for it in the 1911 census.